Looking for easy treats to make on these last few hot summer days? 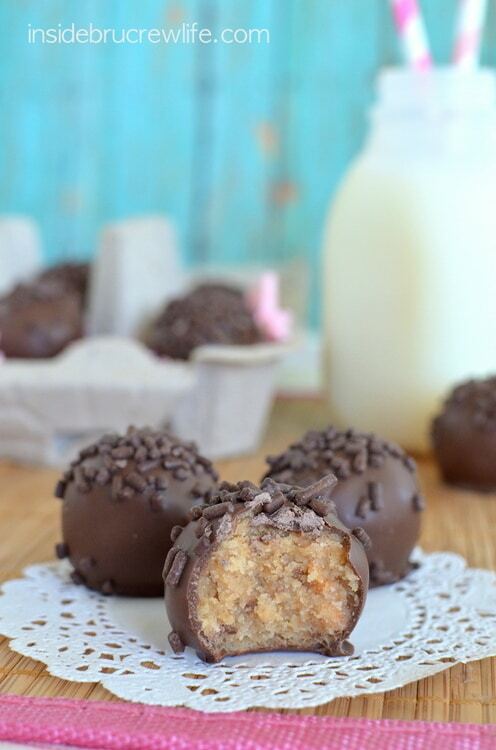 Butterfinger Cookie Dough Truffles are a sweet treat that will not last long around anyone. I really like drinking a cup of coffee every day. It doesn’t matter if it is hot outside or not, I like the first hot cup of coffee to start the day. It kind of helps get me going for the day. Then sometimes I will have another cup of coffee later in the evening. Sometimes that one is cold, or I might go for another hot cup. The problem is if I drink regular coffee that late at night, then I am not sleepy when it comes to bed time. It will be 11, 12, maybe 1 am, and I am still wide awake. Everyone else in my house is snoozing away while I lay there with random stuff just popping to my head. One great thing that occurred to me on one of those nights was a cookie dough truffle filled with Butterfinger Bars. Yes, I lay awake thinking of yummy treats to make…apparently the sugar side of my brain never sleeps. The biggest problem with not being able to sleep. Well, besides getting very hungry thinking up all this yummy stuff! When it is time to get up in the morning and to take the kids to school, I am kind of a cranky mc-crankerson! Have you seen that sign or card that says “Don’t talk to me until I have had my coffee” ? That’s me. Back to the truffles..Butterfinger is in my top 5 favorite candies, so this seemed like such an obvious choice for a new cookie truffle. Mix everything together in one bowl. You do need to let the mixture refrigerate for a little bit. It just helps the truffles stay together better when you are dipping them in melted chocolate. The easiest way I have found to dip truffles is with a toothpick. If you have a better way, I would love to hear it. But poke the toothpick into the melted chocolate and use a spoon to cover the whole truffle. Pull it out and tap very gently on the side of the bowl. Then place them on a tray lined with wax paper. Let it sit for a few seconds before twisting the toothpick out. Don’t wait too long because you want your sprinkles to stick. And the sprinkles are what hide that toothpick hole. Another way to hide the hole is to drizzle chocolate over the top, but sprinkles are just easier and way more fun. Don’t expect these truffles to stick around very long. Cookie dough, butterfinger, chocolate…I mean it’s only normal to eat about 10 at once. Right? Butterfinger cookie dough dipped in chocolate makes a great treat on a hot summer day. In a mixing bowl, cream the butter and sugar. Add the vanilla, salt, and milk and cream again. Slowly beat in the flour. Stir in the Butterfinger bars by hand. 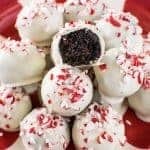 Roll the dough into 35 truffles. Refrigerate 20-30 minutes. Melt the CandiQuik according to the package directions. Dip the truffles into the chocolate covering the whole truffle. Set on wax paper and top with chocolate sprinkles. Let set. Keep in a sealed container on the counter for 3-4 days. They can be refrigerated if they last longer. Haha! He certainly has good taste! 😉 Let me know what you think of these if you make them!! Butterfingers are a favorite at our house. These look and sound delicious, Jocelyn! I am sorry that you can’t sleep, but at the same time, it is so reassuring to know that I am not the only one awake in the wee hours of the morning thinking about cookies/candy/cake! Obviously, you do some excellent middle of the night recipe development! Love these! 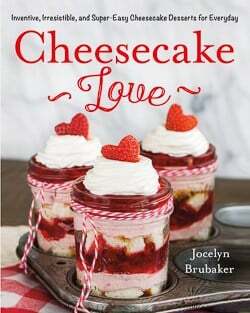 Haha, I ALWAYS think of dessert ideas while I’m either A. Driving, B. Late at night. I have to remind myself to write them down otherwise I’ll lose them again. lol. Sharing these! I always have a cup of coffee in the morning and a cup in the afternoon, helps keep me going. So glad you think of yummy treats so that way we get to enjoy them!!! Maybe I should start drinking coffee late at night so I can dream up of yummy treats like these! Jocelyn, I would like to ask that you KNOCK IT OFF. I do not need Butterfinger Truffles screaming my name all day long like this. Okay, fine. I do need it. I really, really do. Oh my goodness, there is no way I could eat just one of these! They look delicious! I have “truffle shape” envy! I made some over the weekend, using a tooth pick and I felt like it was a sloppy mess. But I also used sprinkles to hide the tooth pick hole! Love the crushed butterfinger cookie dough! HA! When I can’t sleep at night, I have some of my best food ideas. It’s crazy! Here’s to you not sleeping, because these are beyond a great idea. 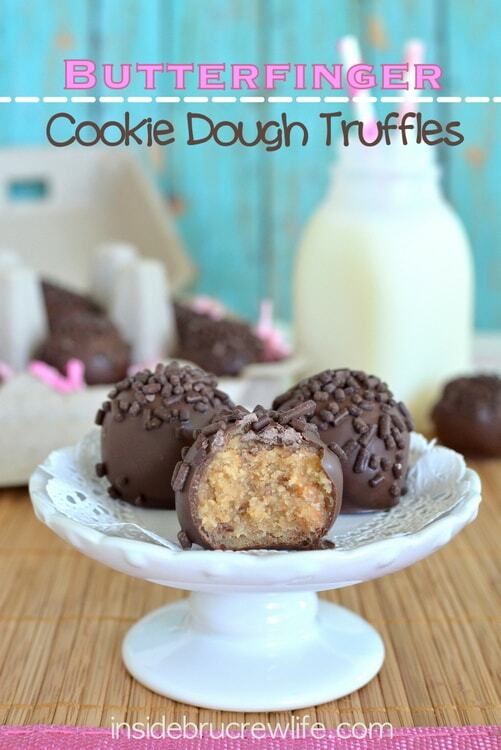 Butterfingers are one of my favorite candy bars ever, and I just love cookie dough truffles. Don’t even talk to me in the AM before I’ve had my coffee, either. I lie away at night dreaming of sweets, too! It must just be a food blogger thing. I love butterfingers, these sound incredible! It’s alright, I think we all lay awake at night and dream about what things we can create. But of course, this is an amazing creation you have done, Jocelyn! I love anything with Butterfinger…my most favorite candy bar. Pinning onto my truffle board! I cannot drink coffee after about 3pm or it kills me! Although I must say, I do come up with good ideas during the night when I can’t sleep too. 🙂 These truffles…really no words! Oh I wish I was thinking up good ideas at night! I need them, my ideas a slacking lately! These look awesome and I all the butterfingers!! 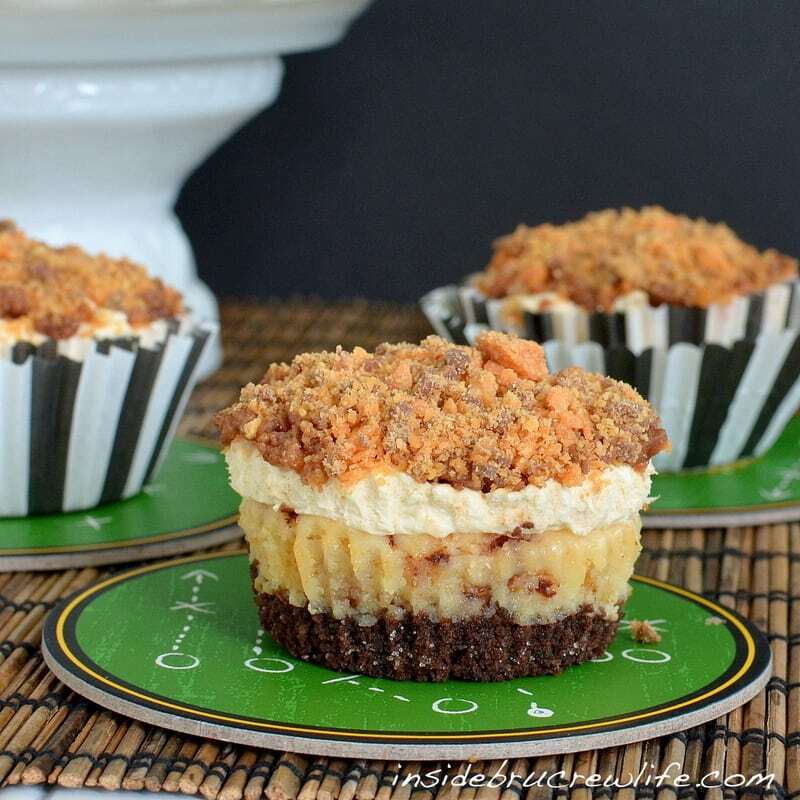 I never think to buy any or use them in desserts, so all your butterfinger recipes excite me! Butterfingers are in my top 5, too. I always look forward to Halloween so I have an excuse to buy a big bag of ’em. 🙂 These look crazy good! I am extremely sensitive to caffeine and a complete insomniac (I’m writing this at 1 AM). I wish I had some of these truffles to keep me company! Oh no!! I wish you had some of these truffles too!! I was lucky enough to try these, and they are freaking delicious!!! Also, I think we truly are related sometimes. I totally need my morning cup of joe before doing anything. I’m even considering putting a Keurig next to my bed, lazy much???? Funny, when I can’t sleep I always think of food. It never helps me fall back asleep, just makes me hungry. I love Butterfingers!!! These sound so good Jocelyn! Haha, yes it makes me hungry too!!! 😉 Thanks Tanya!! I’ve had this thing ever since I was a little girl (don’t ask me why) but I will NOT eat a candy bar that is at room temperature. It HAS to go in the freezer for at least a few days. I just like the way the chocolate and fillings taste. I like biting into a hard candy bar while it slowly warms up. It’s just amazing. Which brings me to my point. I’ve always disliked butterfingers…until a few weeks ago I randomly stuck one in the freezer. I remembered it was there a few days later and let me tell you, it was amazing frozen! Like my new fave frozen candy bar!!! 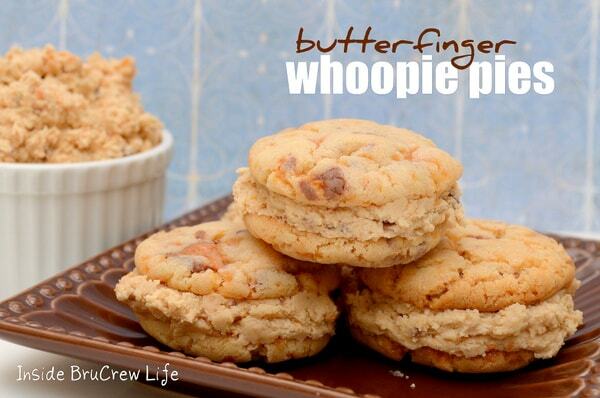 I do like butterfingers in cookies and stuff, so I bet combined with the cookie dough, this would just be AMAZING!!! I love putting candy bars in the freezer too! The cold candy is esp good on a hot day. 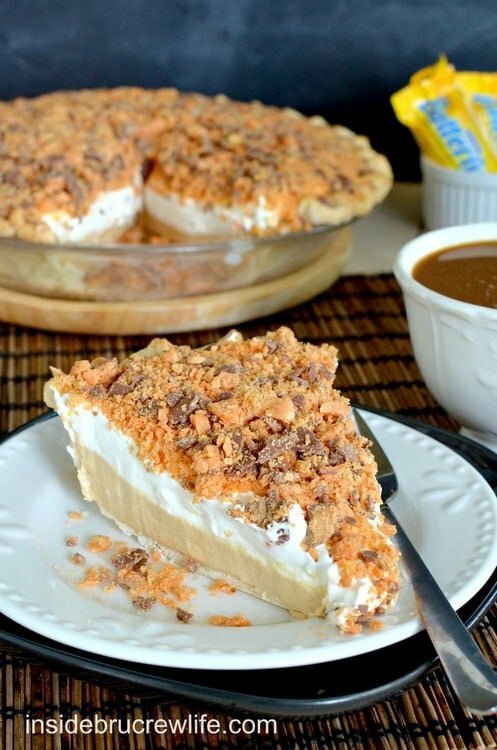 I haven’t tried it with a Butterfinger yet, but now I’m definitely trying it!! Thanks Chels!! 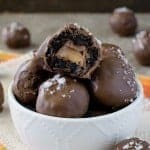 Im a HUGE butterfinger fan and I bet the texture they gave the middle of these truffles is just SO GOOD! haha I lay awake at night thinking of treats too! It’s my thinking/brainstorm time. I loved butterfingers when I was little (still do now!) they were my favorite! I would have a hard time not eating all of these! 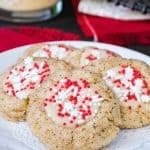 Do you really use all that flour in a no bake cookie, could you substitute powdered sugar, as I don’t think raw flour would taste good? Yes, you use that much flour in these cookies. Believe me, you will not taste it at all. Powdered sugar would make it way too sweet. I dip my truffles with fondue sticks/skewers. They are sturdy and reliable! I can’t wait to try these! 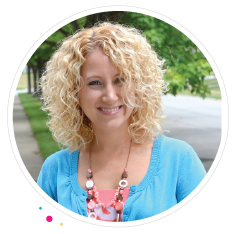 So glad I found your website! Sounds amazing. Butterfingers were my favorite teenaged candy bar! I’m pretty sure those wire dippers for egg dying would would work really well, too. Just might do these someday. Butterfingers are definitely my favorite candy bar; these look amazing! Do it, do it, do it 🙂 You know I support this decision 100%!!! At least if you are kept up from coffee you come up with tasty creations such as these! 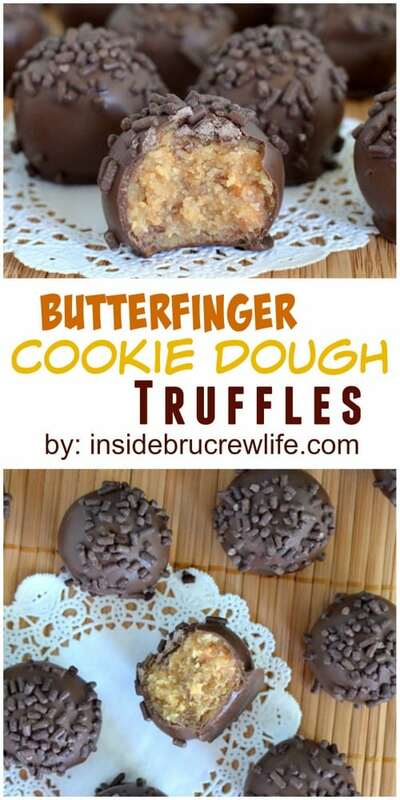 I don’t think I’ve had Butterfinger with cookie dough but sounds like a yummy combo! wow these look absolutely amazing!!! I want to try this recipe, but no where near where I live sells Candiquik. I was wondering if I’d be able to substitute something else like chocolate chips instead, and if so would I use the same amount as the Candiquik sprinkles? 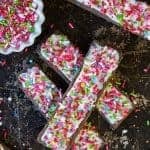 You can use any kind of melting chocolate that you can find like almond bark or Wilton candy melts. You can use chocolate chips too, they will just melt a lot easier in your hands when you are eating them. I would also add a little bit of shortening to the chips when you are melting them, so that the consistency is better for dipping. Did you freeze the dough balls before dipping them? Once they are hard, I used the toothpick to dip them under and tap off. You do need to work fast because the cold cookie dough ball will freeze the melted chocolate pretty quick. I usually dip then sprinkle right away. You can also use a fork if the toothpick doesn’t work for you. I am so sad these didn’t turn out for you! You mentioned wanting to know an easier way to dip things in chocolate. Wilton makes a 3-pack of dipping tools, that I’ve used for years. They don’t cost much, and you can find them anywhere that Wilton products are sold. One of the tools can be used to put a swirl on top of the ball after it is placed on parchment paper. Can’t wait to try these! Butterfingers are my downfall. You asked for an easier way to dip and I hope I can help. I’ve been “dipping” for many many years and this is my absolute favorite. Get a couple of floral foam blocks and some lollipop sticks from your local craft store. Pour your melted coating into narrow/deep coffee cups. Dip the tip of your lollipop stick into your melted coating and then into your chilled cookie/truffle ball and let it set. It helps keep the ball on the stick. Only takes a few seconds. Then dip your ball into the melted coating in the coffee cup, tap off extra by using the edge of the coffee cup and then stick it into your floral block. If it is still dripping, you can stick them in at an angle to let the coating fall off the ball. I always fill up a block and then pop it into the fridge to set. You can leave them on a stick or remove them. The craft store also sells little clear bags. You can bag each ball on a stick and tie a little ribbon or twist tie and give them away. It is a lot faster to dip vs. toothpicks and forks. I reuse my floral blocks over and over. These are amazing. I mean… I would forfeit sleep for a few ideas like this. Hi Jocelyn, I do apologize, you may have already answered this question and i may not have seen it. Hi, Leah. 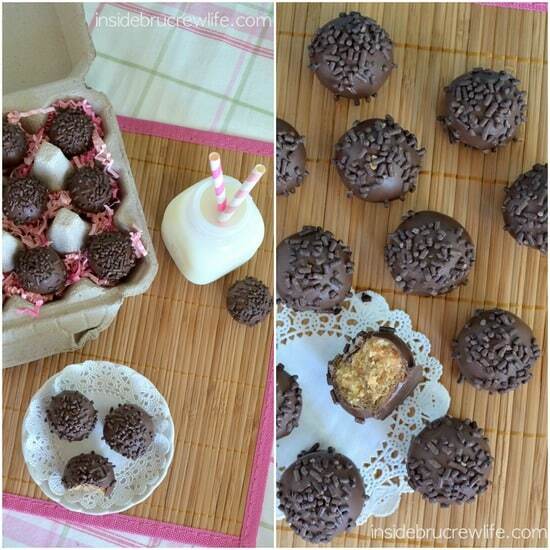 The recipe states to roll the dough into 35 balls (truffles) before dipping in chocolate. Hope that helps 🙂 Enjoy the truffles…they are a favorite here!!! 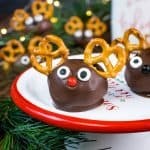 these look really good, I think I’m going to make them with my kids later. Finally do something constructive with some of the Halloween candy we’ve got. These were phenomenal! My oldest daughter said she didn’t even like Butterfingers before, but now she can’t get enough. We did use about 12 ounces of chocolate, no big deal though. What was the additional teaspoon of milk for? Woo hoo! I am so glad you guys liked them. The teaspoon of milk is for the dough…the total I added was 1 Tbsp and 1 teaspoon. Ah, okay I thought it was separated. 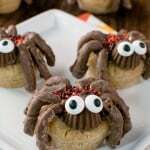 Anyway, really great recipe; I really like being able to do something creative with the Halloween candy. I think I’ll have to make another batch soon. I made these for my husband for Valentines Day and they turned out great. The toothpick idea for dipping was very helpful. Instead of sprinkles I used the rest of the crushed up candy bars on top. Yay! I am so glad to hear you made these and loved them! Great idea to use the leftover candy for the tops too! I’m confused these have flour .but no baking is needed to you just mix all ingredients and no need to bake ?? 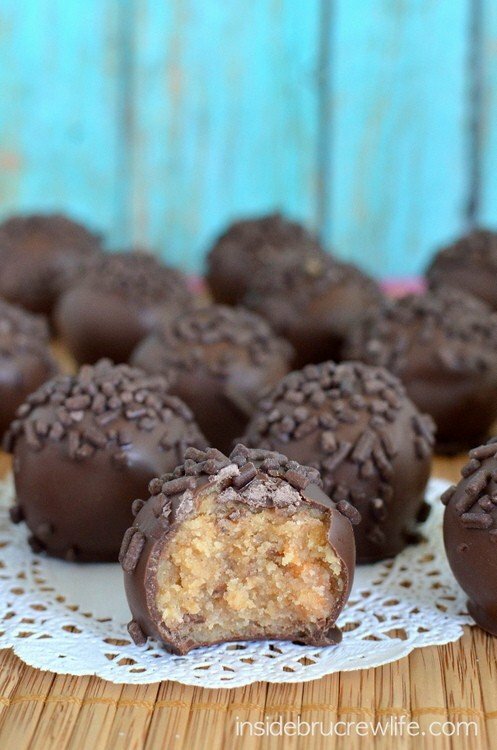 Yes, these are a no bake treat. You can microwave the flour for 1 minute 15 seconds, stirring every 15 seconds if you want to make sure the flour is safe to eat.